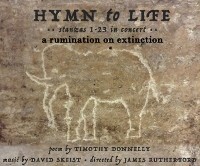 In collaboration with M34 Productions, The Forum @ St. Ann’s presents a work-in-progress concert version of stanzas 1-23 of Timothy Donnelly’s epic poem Hymn to Life on Sunday, April 24, at 6:00 pm, and Monday, April 25, at 8:00 pm. Hymn to Life, celebrated poet Timothy Donnelly’s extraordinary long poem, is by turns a tickling and gut-punching rumination down the rabbit-hole of extinction. For the past year, composer David Skeist, and director James Rutherford have taken up the task of musically adapting this work for the stage. The Forum, the arts and cultural programming arm at St. Ann & the Holy Trinity Church, is pleased to give these talented artists a new context for this performance, which includes a reading of Donnelly’s entire poem. Mr. Donnelly, who lives in Brooklyn and teaches poetry at Columbia University, will be in attendance on Sunday evening and will participate in a Q & A, moderated by fellow poet Dorothea Lasky, following the performance. Admission is free; a freewill offering to support The Forum @ St. Ann’s is welcome.